Arlington Public Schools provides families the opportunity to enroll in an option school/program or request a neighborhood transfer as an alternative to attending their neighborhood school. Option schools/programs have specialized instructional programs that provide pre-K, elementary, middle and high school students the opportunity to thrive in a specialized educational setting. Students may apply for an option school/program or a transfer to a neighborhood school that is accepting transfers based on the Superintendent’s annual update to the School Board. In order to be considered for an option school/program or neighborhood transfer, families must submit an application through the online application portal. If more applications are received than the seats available, APS will conduct a random, double-blind lottery to determine admission to these programs and schools. Below is a brief overview of the options and transfers application, policy, and process for elementary and secondary schools and programs. Information includes key dates and deadlines, along with information about lotteries and waitlists, the appeals process, transportation, sibling preference and more. Families are encouraged to review the Guidebook for Parents to learn more about neighborhood schools and option schools/programs. The Options and Transfers Policy (J-5.3.31) and Policy Implementation Procedure (J-5.3.31 PIP-1) outlines the process determined by the School Board that APS follows to ensure equitable access for all students to the available option school/programs and neighborhood transfers. Families are encouraged to review this policy and PIP for additional procedural information on the options and transfers process. The Virginia Preschool Initiative (VPI) program is a FREE high-quality pre-K program for eligible four-year-old children. Children engage in enriching educational experiences, explore learning materials and new ideas, and build their skills as they prepare to enter kindergarten. The Montessori program is an interdisciplinary, multi-age approach to learning where students work independently and cooperatively in a prepared environment that allows students to work at their own pace. The fees for this program are based on sliding scale contingent on family income. The Community Peer Pre-K Program is available at select APS elementary schools for preschoolers age 3-5 from the community to participate in a high-quality pre-K program. This program provides play-based instruction to target all developmental areas with a focus on communication, interactions with peers and adults, as well as fostering growing independent skills. This program is aligned with the Virginia Preschool Initiative (VPI) program and differentiated to meet student’s needs. The fees for this program are based on the same sliding scale as the Montessori program and is contingent on family income. Students are admitted to these programs throughout the year as seats become available. TO APPLY: The application for the VPI and Montessori programs is available on the online application portal. For the Community Peer Pre-K Program, please contact the Early Childhood Office at (703) 228-8665 to schedule an appointment to apply for the program in-person. Additional information is available on the Preschool Options and Transfers page. Option Schools: Arlington Traditional, Campbell, Claremont, Montessori Public School of Arlington, and Key. Neighborhood Transfers: APS is unable to offer elementary neighborhood transfers for the 2019-20 school year. However, families that would like to request their child attend an elementary school other than their neighborhood elementary school can request an administrative transfer (appeals process). Information Night: Watch the Kindergarten Information Night video or view the PowerPoint presentation. In addition, each elementary school offers multiple information sessions for families. Waitlists: The waitlist for elementary option schools is maintained year-round, and families will be notified if they are on the waitlist and a seat becomes available. All waitlists reset when the options and transfers period begins each year, so families must reapply if they are still interested in attending a school or program they applied to previously. Sibling Preference: Siblings who will be concurrently enrolled at the same elementary school will receive priority in admission. Transportation: Transportation is available for students attending option schools/programs. However, bus stops may be centralized and a longer distance from a student’s residence. Transportation is not provided for neighborhood or administrative transfers. Appeals: Families with students placed on a waitlist can file an appeal for an administrative transfer under the appeals process. Approval under the appeals process occurs after the lottery and the timeline to accept or decline options and transfers offers. TO APPLY: Submit an Elementary Option School Application through the online application portal. Additional information is available on the Elementary School Options and Transfers page. Option Schools/Programs: Spanish Immersion Program at Gunston, Montessori Middle Years Program at Gunston, and H-B Woodlawn (Grades 6-8). Neighborhood Transfers: The application period to apply for a neighborhood middle school transfer has closed, but families are still able to submit an application through the online application portal to be placed at the bottom of the waitlist. 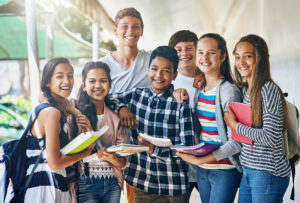 Information about middle school transfers for the 2019-20 school year is available on the Middle School Requesting a Transfer Families that would like to request their child attend a middle school other than their neighborhood middle school can request an administrative transfer (appeals process). Information Night: Watch the Middle School Information Night video or view the PowerPoint presentation. In addition, each middle school offers multiple information sessions for families. Waitlists: Middle school neighborhood transfer waitlists will be maintained by the APS Welcome Center until May 1, 2019. Options seats are continuously filled throughout the school year as seats become available. Families will be notified if they are on the waitlist and a seat becomes available. If families do not accept or decline a seat by the deadline, the available seat is given to the next student on the waitlist. All waitlists reset when the options and transfers period begins each year, so families must reapply if they are still interested in attending a school or program they applied to previously. Sibling Preference: Sibling preference is not currently offered at the middle school level. To Apply: Apply to be placed on a middle school options and transfers waitlist through the online application portal. Additional information on middle school options and transfers is available on the Middle School Options and Transfers page. Option Schools/Programs: Advanced Placement (AP) Network at Wakefield, Arlington Tech at the Arlington Career Center, H-B Woodlawn (Grades 9-12), Spanish Immersion Program at Wakefield, and the International Baccalaureate (IB) Program at Washington-Lee. Neighborhood Transfers: The application period to apply for a neighborhood high school transfer has closed, but families are still able to submit an application through the online application portal to be placed at the bottom of the waitlist. Information about high school transfers for the 2019-20 school year is available on the High School Requesting a Transfer Families that would like to request their child attend a high school other than their neighborhood high school can request an administrative transfer (appeals process). Information Night: Watch the High School Information Night video or view the PowerPoint presentation. In addition, each middle school offers multiple information sessions for families. Waitlists: High school neighborhood transfer waitlists will be maintained by the APS Welcome Center until May 1, 2019. Options seats are continuously filled throughout the school year as seats become available. Families will be notified if they are on the waitlist and a seat becomes available. If families do not accept or decline a seat by the deadline, the available seat is given to the next student on the waitlist. All waitlists reset when the options and transfers period begins each year, so families must reapply if they are still interested in attending a school or program they applied to previously. Sibling Preference: Sibling preference is not currently offered at the high school level. Additional information on middle school options and transfers is available on the High School Options and Transfers page.